Liz Obi | Do you remember Olive Morris? While I was liaising with Lambeth Archives over the publicity for the weblog launch, the name and contact of Liz Obi was given to me. Tim O’Dell and Jon Newman had been in touch with her to source some images for the BHM programme. After a few emails and phone calls, I met Liz for coffee at Brixton Market. On that morning I learned more about Olive Morris than in a whole year of poking and probing archives and the Internet. Liz had been a close friend of Olive at one time. Together they squatted 121 Railton Road, and in 1972 they hitch hiked their way to North Africa in search of a Black Panther in exile. After questioning me and listening at my story and my reasons for wanting to do this project, Liz agreed to help me. I invited her to speak at the web launch, and she kindly offered also to bring some of the exhibition materials to arrange a display on the day. Liz invited me to her house to see the materials she had. When she organised the exhibition at Brixton Library in 2000, Liz added to her personal archive, photocopies of items found in libraries and archives. Having lived through those years, Liz knew what and where to look for information. She also contacted Mike McColgan, a long-term friend of Olive. 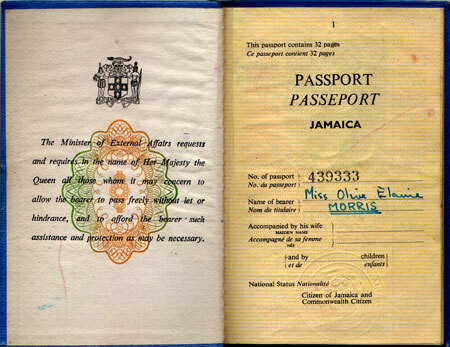 Mike had in his possession many documents belonging to Olive, including school notebooks and college essays, correspondence with several community organisations, albums of personal pictures, and even notes of condolence received after Olive’s death. He gave all this material to Liz, to complement the materials she had already gathered for the exhibition. For my visit, Liz had taken all the documents out of storage, and even pinned up several items on the exhibition boards. She had prepared also a selection of books that were influential to her and Olive in the 70s (see reading list). Liz talked me through the items I was picking up at random, answering my questions and adding her personal comments and stories. I was like a kid in a toy shop, and Liz had more or less to throw me out of her house. I could have stayed there all day going through this amazing collection. 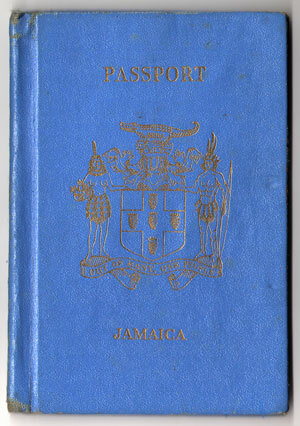 I left with a handful of borrowed pictures and documents to scan, now published on this website, including Olive’s passport. This was was specially moving for me, to have her passport in my house, it made me feel as if I myself had been a friend of Olive. Of the many things that Liz had to say about Olive, there were two that stood out for me. The first was Liz description of Olive, and how she always visualised her whenever she thought of her: silver bangles on her arms and forever riding her bike. The second had to do with what Liz had learned from Olive: never to be afraid of anything.